Home » News » KMS Can’t Stop the School to Watch Feeling! KMS Can’t Stop the School to Watch Feeling! Every day at KMS is a great day but May 31, 2018 was exceptionally fun! In the morning, all students and staff received white Kennett PRIDE t-shirts courtesy of the KMS PTO and then we had the Kennett High School Class of 2018 Senior Stroll. It seems like just yesterday the seniors were here at the middle school. Please check out some pictures on our KMS Twitter page. To top off a great day, in the afternoon we had our Schools to Watch celebration assembly. We are so proud to be redesignated as a Pennsylvania School to Watch and to be one of 38 middle schools in PA and 450 middle schools in the country to receive this designation. 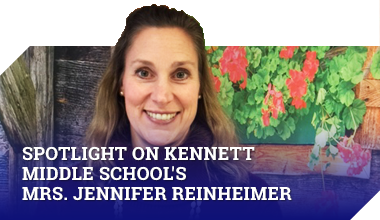 It is our students, families, staff, and community that make Kennett so special. We even had a special visitor at the end of the assembly who accompanied us to the buses… The Phillie Phanatic! Pictures on Twitter! We have a feeling here that we just can’t stop… please enjoy our celebration video that we played at the assembly today: Kennett Middle School – A School to Watch – Can’t Stop the Feeling! Video.